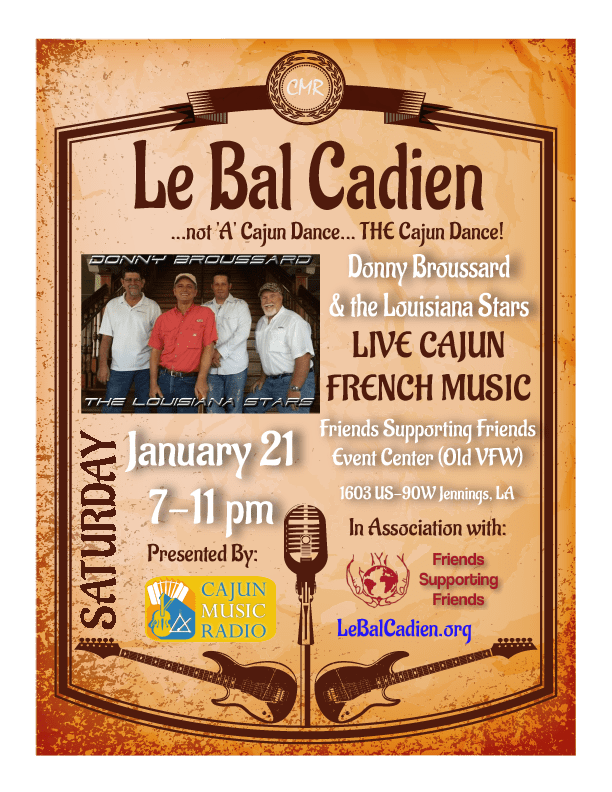 If you ready to do some Cajun Dancing, then come join us at the inaugural Le Bal Cadien Dance on Saturday, January 21, 2017 at the Friends Supporting Friends Event Center on Highway 90 West in Jennings, LA. FSF will be serving adult beverages and Cajun food. A guitar singed by the Legendary D.L. Menard will be raffled and a student accordion will be given to a local young person who has pledged to dedicate him/herself to playing Cajun music. Come out and meet the staff of Cajun Music Radio and enjoy a good ole fashioned Cajun Bon Temps sponsored by CMR and Friends Supporting Friends. Proceeds will benefit the CMR Cajun Youth Musician Program and FSF. This is a family friendly event so bring everyone from Maw Maw and Paw Paw to the babies!